This course is an exploration of British collectors of classical antiquities, their activities and attitudes, and the wider influence of this process up till the present day. A classic example of Roman plunder. This link gives you more information about the victiory stele of Naram-Sin, now in the Louvre. This link takes you to an image of the Attic Black Figure kylix by Exekias depicting the dire consequences of piracy. 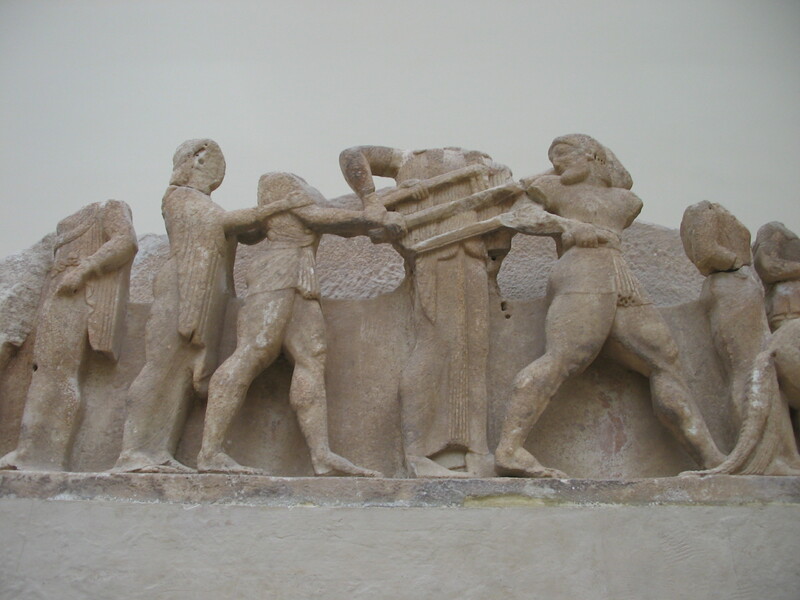 These photographs show the tussle between Apollo and Herakles for the Delphic Tripod. This model shows the Athenian Acropolis as it might have looked on the eve of Xerxes’ invasion - 480 BCE. The "Tyrannicides" - statues of Harmodios and Aristogeiton. Xerxes took them from Athens to his capital at Susa. This link takes you to an English translation of Cicero's 1st Oration Against Verres. This link takes you to an English translation of Cicero's speech In Verrem 2.4. This link gives you more information about Cicero's prosecution of Verres. This link takes you to some images related to Cicero's prosecution of Verres. An archaic Greek sphinx. Roman collectors loved sphinxes. This link gives you some useful information about Lausos and his collection. This link takes you to an entry about the Arundel Marbles in Chambers' Book of Days. This link takes youto an article entitled The Arundel and Pomfret Marbles in Oxford by Michael Vickers, in Minerva, Nov/Dec 2007. This link gives you access to a site where you can explore the shapes and functions of Greek vases. This link takes you to some basic information about making Greek vases. This link takes you to a brief video from the J. Paul Getty Museum about how Greek vases were made. This link takes you to an article in the New York Times about the repatriation of antiquities. This link takes you to an article about the repatriation of the Euphronios Krater. This link takes you to an image of a portrait medallion of Sir William Hamilton made by JOsiah WEdgwood and Sons, now in the V&A, London. This link takes you to an article entitled 'Sir William Hamilton’s Neapolitan houses' by Carlo Knight. This link takes you to a short biography of Emma, Lady Hamilton 1765 - 1815.